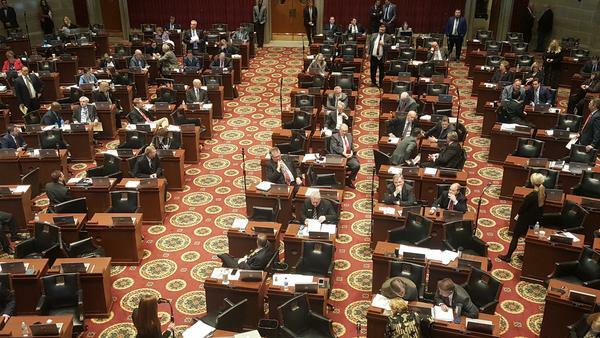 Members of the Missouri House of Representatives debate the chamber's prescription drug monitoring bill on Wednesday. Missouri remains the only state without a statewide prescription drug monitoring program, though it is a step closer. Again. The House debated the bill, which aims to stop the overprescription of opioids, for more than four hours on Wednesday, casting an initial vote in favor. A final vote could come as soon as Thursday. This year’s House bill was sponsored, as in the past, by Rep. Holly Rehder, R-Sikeston. Despite the support of Gov. Mike Parson and other key leaders, some Republicans are still opposed to the program, citing concerns about privacy and apparent effectiveness in other states like Ohio, which is still dealing with an opioid abuse crisis despite the monitoring program. Two representatives tried to offer amendments that would require physicians to use the database. The current bill requires pharmacists who dispense narcotics to report information to the database, but it does not require pharmacists or physicians to use to the database before dispensing or prescribing drugs. Rehder objected, saying that the bill has failed when such an amendment is added. She also said other states have seen success with their programs, and none has moved to repeal them. Both the House and Senate bills would phase out the prescription drug monitoring program established by St. Louis County in 2016 in response to a lack of action at the state level. Half of the state’s counties, including Jackson and Clay, have joined the program. But many others, mostly in rural areas have not. That includes Platte and Ray Counties. The Senate’s version is sponsored by Parkville Republican Tony Lutkemeyer and didn’t make it out of the chamber’s Seniors, Family and Children Committee on Wednesday because the committee deadlocked with a 3-3 vote. But Lutkemeyer said the Senate will likely consider the House bill soon. Missouri Gov. Mike Parson thinks the state is “long overdue” for a statewide prescription-monitoring database for doctors. Parson, a Republican, said Wednesday he hopes state legislators will pass a bill legalizing such a program next year. Missouri remains the only state without such a database, which proponents say helps cut down on opioids being sold on the street. Parson made his remarks during a St. Louis stop on a weeklong statewide tour focusing on health issues. He met with state health officials and St. Louis Mayor Lyda Krewson to discuss Missourians’ addiction to opioids. The drugs in 2017 killed 760 people in the St. Louis region alone, and 951 in the entire state. One in every 65 deaths in Missouri that year was due to an opioid overdose, according to the the state’s health department.